Glendowen Craft Studio was established by Ann Mc Gonigle in Meentagh Glen, Clonmany, in the breathtaking Inishowen Peninsula in Co. Donegal. Steeped in tradition and the crafts that have been handed down from generations, Ann uses only the finest Donegal Tweed and yarns to create beautiful, original garments. Glendowen Craft Shop and Studio encapsulates the beauty and spirit of the Inishowen Peninsula. Based in Meentagh Glen, Clonmany, the beautiful workshop and retail outlet is where tradition meets modernity, beauty meets function and ‘craic agus ceol’ rings around its walls. It is here among the hills, that you will find garments and accessories of the very best Donegal Tweed, expertly and lovingly hand-crafted on the premises by Ann Mc Gonigle. Ann’s craft was passed down through the generations of those before her. She learned from and is inspired by her own, late mother, a talented crafts person who taught her daughter the art of sewing and crocheting from a very young age. These generations of learning and tradition are sewn into all of Ann’s own, original pieces. You could say that each item at Glendowen Craft Studio is its very own piece of Inishowen, both then and now. Ann specialises in a beautiful range of ladies’ garments with a gorgeous hand-crochet finish. These include jackets, coats, capes, wraps, tunics hats, scarves, bags and jewellery. The Donegal tweed that is used is woven by the world famous Magee’s of Donegal Town and Mc Nutts of Downings, also based in Donegal. Crafts are a great love of Ann’s and this is evident in the shop and studio, which stocks a wide range of local and Irish crafts, sourced and approved by Ann herself. Each piece and garment purchased at Glendowen Craft shop is a unique investment. Approx. 70% of all stock is specially created in the traditional-style workshop. You will not find its like or its kind elsewhere. Each piece, which is both traditional and modern, will be cherished for many years to come and will be truly ‘limited edition’. 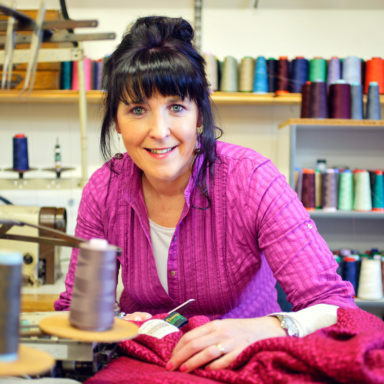 Ann who you will personally meet when you enter the shop, was also commissioned to create bespoke wall hangings from Donegal Tweed. Inspired by the local, rugged scenery that envelopes Meentagh Glen and the peninsula, Ann includes some of the natural stones from the breathtaking and award-winning beaches along the wild Atlantic Way. These original works of art are in the shop to view and purchase. The Glendowen Craft shop, which is wheelchair accessible, is located just 5km of the main Wild Atlantic Way route on the main Buncrana to Clonmany road and is well worth the short diversion. Perhaps you might stumble upon one of their regular traditional music seisiuns, which are held once a month at the studio. Here local musicians gather together for an afternoon of music, song and dance – Inishowen style. The Inishowen peninsula is steeped in beauty, mysticism, wonder and tradition. You have now found the place where this all comes together. Glendowen craft shop welcomes you.